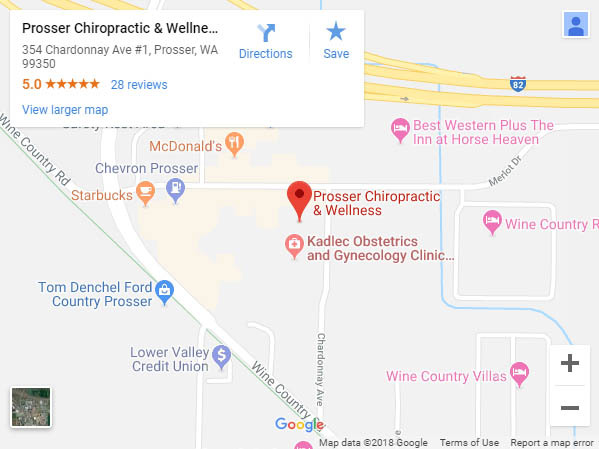 Prosser Chiropractic & Wellness is committed to helping patients discover a happier, healthier, pain-free life through the healing power of chiropractic and massage therapies. We treat patients like individuals, always seeking to discover and treat the root cause of pain. Schedule an appointment today and let’s explore the path to optimal wellness together. Before you reach for OTC medications or struggle through yet another day of chronic pain, contact us first and schedule an appointment. Let us introduce you to the power and potential of a most holistic wellness approach. Pain is a complicated problem to deal with because everyone experiences it differently. Unfortunately, most people find relief in a pill bottle or simply struggle through it. Properly treating it requires a completely individualized approach that’s holistic and calculated. That’s why more and more people are turning to a chiropractor in Prosser, WA. At Prosser Chiropractic & Wellness, we’re committed to helping you resolve your pain by looking beyond the symptoms. While pills only cover the pain, we seek to address it head-on! By examining your spine and your body from a holistic standpoint, we’re able to pinpoint catalysts for pain and administer the treatments that resolve them. From chiropractic adjustments for spine realignment, to massage therapy to relief stress and tension, and beyond, our goal is to free you of pain and put you on the path to natural wellness. Our chiropractors in Prosser, WA are trained in a variety of modalities, ensuring every treatment is tailored around the individual. We spend one-on-one time getting to know you, your pain and your lifestyle, then recommend treatments that specifically address your concerns. It’s through this individualized attention that we’re able to get results, without subjecting patients to stopgap measures or invasive solutions. Our clinic is designed to give you peace of mind and comfort as soon as you enter, from our soothing décor to our friendly desk staff. We’ll put you at ease! We’re a member of the Prosser Chamber of Commerce and welcome patients from throughout our local communities, including Benton and Yakima Counties. We believe in getting to the root of problems and treating the core issue, not just symptoms. Our goal is to facilitate healing in an organic, sustainable way. Count on us to spend time one-on-one with you, so we can get to know about your pain and recommend specific treatments and tips for overcoming it. We’re well-versed in a variety of chiropractic and massage therapy modalities, delivering adjustments that are tailored around each unique patient. Put down the pills and stop simply masking pain. Let our clinic help you pinpoint and treat the root cause, using holistic chiropractic and massage methods. Schedule an appointment today!